I never forget, but it’s hard to remember. Was caught of guard last night when I saw the date was September 10th. Here in Los Angeles, where “your feelings change but seasons never do” (Sherwood) it’s difficult for me to feel the date. Is it August or March? It’s hard to tell. I grew up on the east coast, where that one week of shifting sun in August leads to the brisk breeze of September. You can feel it, in the sun, in the wind, in the noises at night. Even after 7 years here in LA – I don’t. 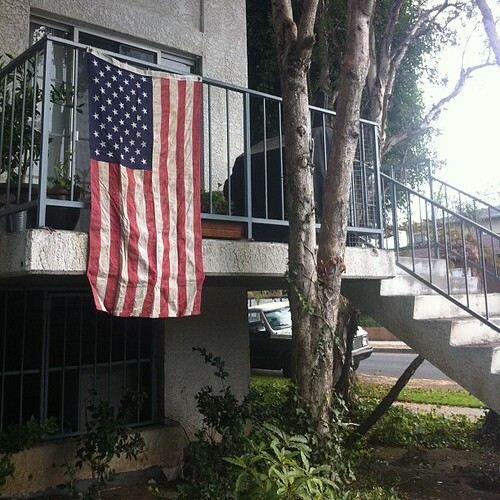 But this morning I was reminded of the importance of the date when I saw this flag hanging from a neighbor’s balcony. Didn’t take her as a political person, but then again, neither am I. And I appreciate the symbol, the gesture, the recognition.